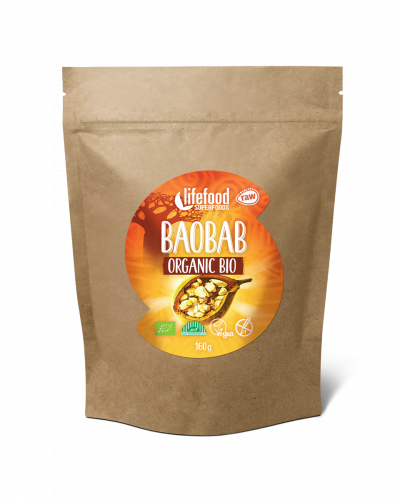 Organic raw baobab 100 % natural dried fruit pulp powder. Baobab fruit pulp (Adansonia digitata) dries naturally inside the hard-shelled fruit of the African Baobab tree. Then it is picked and sifted to obtain a 100% natural powder, high in fibre and vitamin C.
Cold use recommended only, otherwise the nutritional properties may get damaged. Suggested dosage is 1-3 teaspoons per day (5-15 g), but being a fruit pulp there is no maximum dosage for Baobab. Should not be used as a meal replacement. We keep searching for new ways to connect both the functional and eco-friendly aspects of our packaging. Our Raw Organic Baobab Powders are now in eco-friendly compostable packaging. By choosing our baobab you not only do the best for your body but also support nature. Thank you. 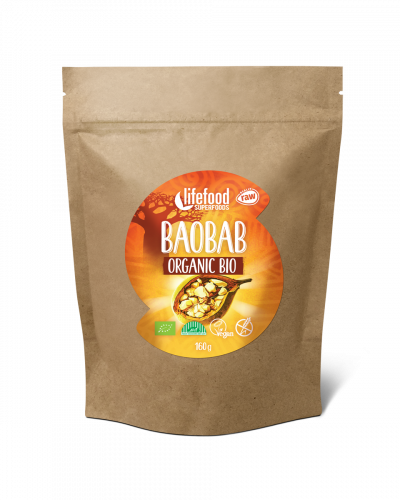 Baobab Fruit Pulp* (100 %).